Salmon and Whitefish Dinner with Vegetables is an excellent source of high quality protein. This grain-free dinner includes wholesome vegetables like peas and carrots. The salmon and whitefish tuna are wild caught and dolphin safe. 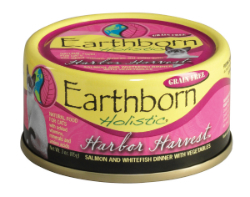 The fleshy cuts of fish are flaked straight from the bone and sure to please your finicky cat. Salmon and Whitefish are rich in Omega 3 fatty acids which promote healthy skin and coat, are highly digestible and help your cat maintain top condition and overall good health. Harbor Harvest™ is 100% guaranteed for taste and nutrition. Harbor Harvest™ is produced in a human grade facility using many of the same ingredients and processes that are used in "people food."